According to a late Friday report on InsiderNJ, attempts by the Hoboken's Old Guard Russo faction to win the primary line under Assemblyman John Wesniewski who is running for NJ governor failed. The effort came after Mayor Zimmer's Reform team rebuffed attempts to share the local Democratic committee Line A under NJ gubernatorial candidate Phil Murphy in the June primary. Assemblyman John Wisniewski (D-19) won’t bracket with Hoboken Councilman Mike Russo’s local committee candidates after all, a source close to the Hudson County Democratic Organization (HCDO) told InsiderNJ, which the Wisniewski Campaign confirmed. Yesterday, the alliance between the long-shot gubernatorial candidate and the ward councilman appeared on track. But Greg Minchak, spokesman for Wisniewski Campaign, said Wisniewski shut it down. “Yesterday they reached out to us and we told them we didn’t want to bracket with them,” Minchak told InsiderNJ. A day earlier, April 6th InsiderNJ story reporting the Russo faction Democrat committee candidates would run under Wisnewski was either premature, inaccurate or in retrospect rejected. Old Guard leader Councilman Michael Russo saw a Plan B to run his Democratic Committee slate under NJ Assemblyman John Wisniewski crushed as news broke late Friday it isn't happening. Mayor Dawn Zimmer has already acquired the line under the Democratic favorite for NJ governor, former US Ambassador to Germany Phil Murphy. Anthony "Stick" Romano is also on the same Line A leading to some serious agita in the Old Guard camp. As one Old Guard source excerpted from the last issue of MSV Premium said, "Romano is running above his line without his committee under him." Now the Russo faction Democrat committee candidates may be as close to Phil Murphy's Line A as Siberia. 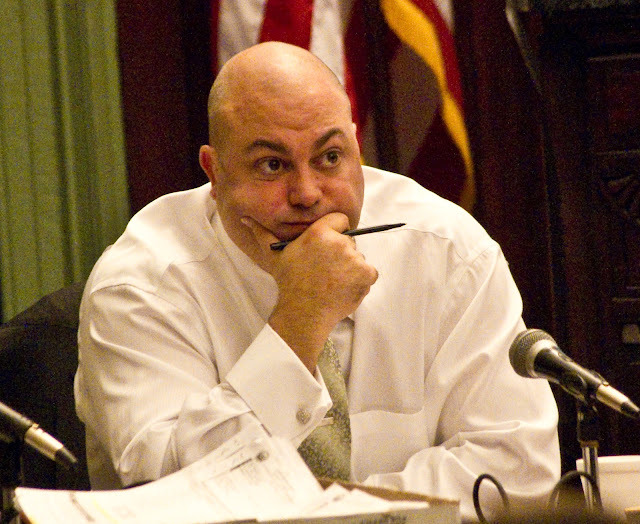 Councilman Michael Russo's Solomon Dwek FBI informant problems aren't gone nor forgotten. Related: MSV's exclusive series of stories in 2011 of Councilman Russo's Jersey City lunch meeting with FBI information Solomon Dwek re: the Jersey Sting, directly led to the release of the FBI surveillance tape.